An alphanumeric low cost LCD Display is very essential for may small and big projects to Display various type of information. Hitachi HD44780 Chipset based 16x2 char LCD is Really very cheap and easily available in the local market. In this project we are going to learn various things about this chip set and displaying text on this LCD. The HD44780 16x2 char LCD screen Use 8bit and 4 bit parallel interface with backlight. 1. Displaying "Hello Word!! LCD " message on the scree. 2. 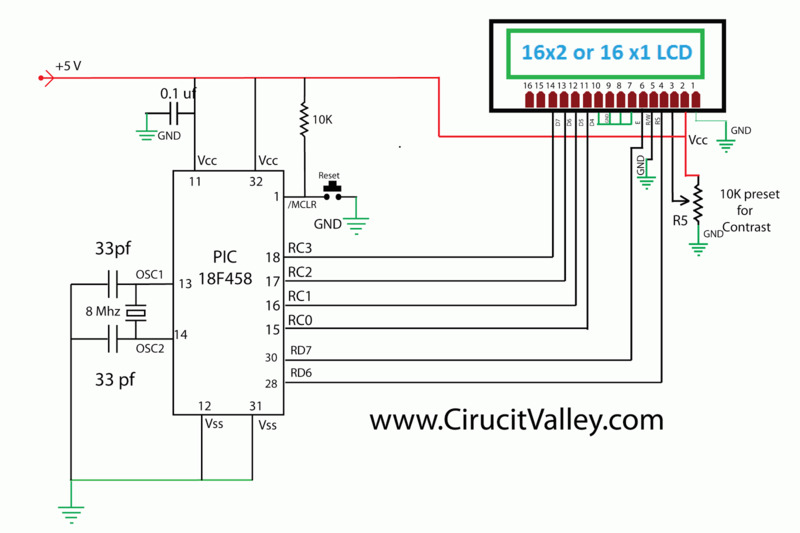 Interfacing The LCD to the Microcontroller Using 8bit Mode and 4 Bit Mode. 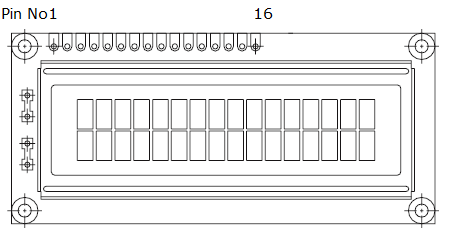 as i have mentioned before this type of lcd are connected to microcontroller using parallel 8bit or 4bit lines. using 8 bit method is quite simple but take 8 lines (for data or command)+ 3 control signal total 11 line , i guess few small microcontrollers don't even have that much of I/O lines ,so in 4 bit mode total 7 lines (sometimes 6 ) are required . in this tutorial i will show you with both of the methods . in 8 bit mode all the Data line DB0 to DB7 are being used for transferring the the data to lcd but in 4-bit mode only 4 line form DB4 to DB7 are being used to transfer the 8 bit wide data in two peaces one after another . we can't display any data on the lcd until all the required internal command register of the lcd are not being properly initialized. so now we will learn how to initialize the lcd. clear and place the cursor in the first position (address 0). The bit I / D to 1 by default. Place the cursor in the home position (address 0) and make the display starts to move from its original position. The contents of the RAM display data (DD RAM) remains unchanged. The address of the RAM for display data (DD RAM) is set to 0. Set cursor moving direction and specify that the display moves to the next position of the screen or not. These operations are performed during reading or writing of the DD RAM or CG RAM. To view usually set bit S = 0. Turn on or off by turning ON / OFF both the LCD (D) as the cursor (C) and whether or not this last flash (B). Move the cursor to move the LCD without changing the memory contents of the display data DD RAM. Set the size of interface with the data bus (DL), number of lines in the LCD (N) and character type (F). 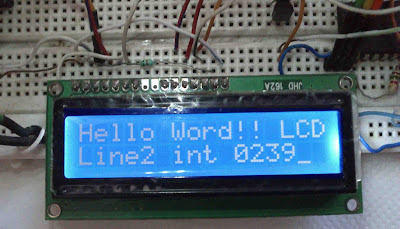 The LCD module defined in addition to all the ASCII character set allows the user to define 4 or 8 characters. The composition of these characters is saved to a CG RAM memory called up to 64 bytes. Each user defined character consists of 16 or 8 bytes that are stored in successive positions of the CG RAM. Using this instruction sets the CG RAM memory address from which the bytes will be stored that define a character. Running this command all the data that is subsequently read or write this memory made from CG RAM. The characters or data to be displayed is stored in a memory called RAM DD then move on to the screen. Using this instruction sets the address of DD RAM memory from which data will be stored to be displayed. Running this command all data being written to or read then they will from the DD RAM memory. 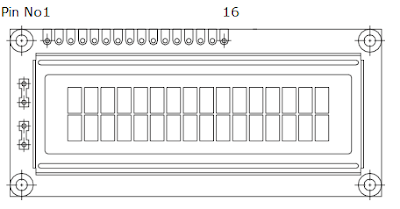 8Fh addresses 80h to 16 characters correspond to the first row and addresses C0h to CFH to 16 characters of the second row, for this model LCD. E l LCD module takes some time to execute instructions, at which time you should not send another instruction. This flag has a BUSY (busy) indicating that an instruction is being executed. This reading instruction reports the status of the flag as well as providing the address counter value of the CG RAM or DD RAM according to the latest that has been used. Command to write to DD RAM memory the data to be presented on the screen in ASCII code. Also written to CG RAM memory bytes to generate user-defined characters. Previously DD RAM memory addresses or CG RAM memory where you want to write data. Command to read data stored in DD RAM, ASCII code. Likewise, read CG RAM memory bytes of user-defined characters. Previously, memory addresses or memory DD RAM CG RAM you want to read the data. and have been unable to find any code to make the LCD work. I am quite the newbie. Thanks for your reply. I unfortunately do not see any lines of code that specifies my port configuration in the lcd16.c file. Am I just not seeing it? I appreciate your patience with me. Not lcd16.c, its lcd16.h .... ok? Hi, i am Akram i am a new comer in the embeded system programing,i want to use HD-44780 LCD with AT89C51 microcontroller,is it possible to guide me Circut Diagram using AT 89C51 with HD-44780 interface. 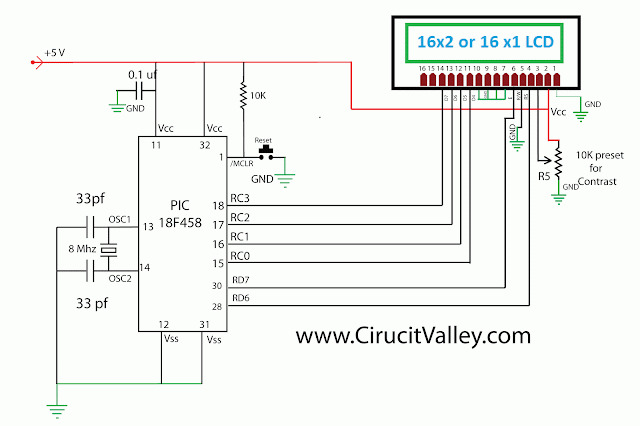 sir,what is the code to read the data present on the 80 location of the 16x2 lcd? as you can see the schematic the R/W pin is grounded the , so first of all you need to connect this pin to a mcu port pin . and then pull this pin to high for read some value . you blog is very neat and clean. If you upload videos for the projects outputs it will bring the readers(like me) will enjoy more. hey which simulator do you use? is possible send me the link to download it, preferably a freeware, i want to simulate LCD along with the internal ADC, i am using PIC18LF23k22 or PIC18f23k20. Hi! We need to use 16x2 alphanumeric lcd based on hd44780 controller for our project but it is not available in our country, do you know what can we use as an alternative where in it has the same functions and specifications with hd44780. Thank you so much. normally all 95% LCDs are based on this hd44780 controller, but it dosn't mean that same controller should be in the LCD. you try any LCD hope fully that will work. If I were to use a different pic controller and 4MHz crystal or internal oscillator from the pic. Just changing the configuration bits should do it? Would that created some kind of timing issues? I am trying to use PIC16F690. Thanks! This code does not seem to be working for me. I am using the Pic18f4331 and a 10MHz external oscillator with 33pF capacitors. Does anyone have any suggestions? Is it possible to use only the D port instead of C and D port? If so, what lines of code need to be changed? i want to know.. my project using LM016L Hitachi LCD like in protues.. my simulation was run very well.. but in real hardware.. if i want to use LCD type HD44780 16x2 it is ok?? i mean the the coding that i use is same for these LCD?? Hi! after loading your #include file ( ldc16.h.) and compiling, I received and error " could not open source file p18f458.h" in your ldc16.h file. How can I fix this error. sir my project is main lcd digital clock display is there,and again two lcds are interfacing with that clock,is lcds are following that time it is how?it is possible sir?